Observing ringed birds is always exciting and about a month ago I was able to take a picture of a ringed Great White Heron. A few days ago I received the answer from the ringing group. As I had assumed the bird had come from Hungary, more precisely from Szabadszállás, which is located south of Budapest. 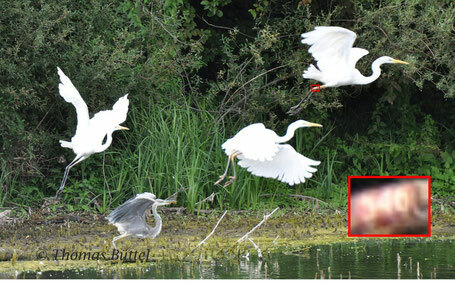 Altogether the Heron has been wearing his legring (red: 546) for five years by now and has already been observed twice in exactly the same site as I have. This is quite interesting, since Great White Herons are expanding westwards. A few years ago a Great White Heron would have been almost a rarity, in contrast to the present day, where this species has become quite a common guest during the winter with some individuals even staying all around the year. The westernmost breeding site for this species is Lake Neusiedl in Austria, though it won´t take too long until the first German breeding-colony will have been established. Back to my bird: Checking the other observation data it clearly struck that the heron had always been observed in the end of August or respectively in the first days of September. This means either that it is regularly resting in the Lakes of Garstadt or that it is staying here all around the year. At my next visit of the Lakes of Garstadt I will certainly look out for this heron.